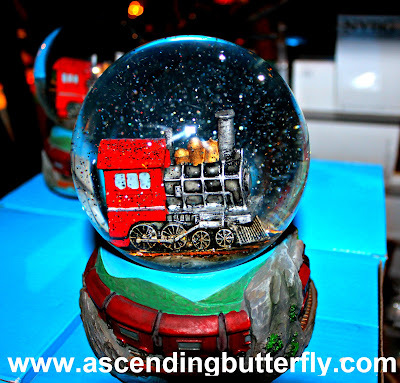 Did you miss my coverage of the annual New York Botanical Garden Annual Holiday Train Show? If so, see more pictures HERE! Have you ever owned a Snowglobe? I love that shot. Snow globes are the best. I used to sit for hours with snow globes. They're very soothing. I LOVE snowglobes. I get one from every place we visit. I have them all on display in my office. Some are so ornate and play wonderful music! What a beautiful snow globe. My mom used to own several but I have no idea what happened to them. The first thing I thought when I saw the picture was "Gosh, I want that snow globe." We just put the Christmas one away. Maybe it's time to dig it out. This is a fantastic picture. Love snow globes! We are expecting more snow tonight so it feels like living in one! I love snow globes. When I was a child I had a snow globe of Santa and his reindeer. What a lovely snow globe. This is such a beautiful snow globe. I have a few that i have had for years. My favorite is one with an Owl in it my Daughter gave me for Christmas one year. We've owned and broken quite a few snowglobes over the years :) Definitely a nice momento! My daughter loves to collect snow globes. They're her favorite sovenir whenever we go on vacation. She'd love this one. These are stunning and show such action. Yes! I love them. They bring back happy childhood memories. I used to buy them as souvenirs when traveling too. I had bunches of them as a kid. I love snow globes. When my daughter was young she had snow globes from all of our travels.